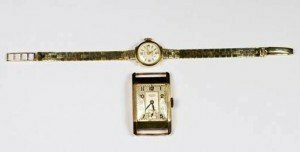 A lady’s Clarex wristwatch in a 9 carat gold case, on a 9 carat gold bracelet, together with a gentleman’s wristwatch in a 9 carat gold case. 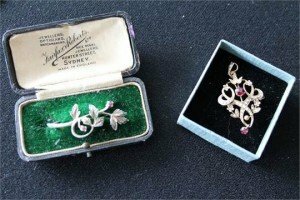 A small collection of jewellery to include, a Victorian silver brooch decorated flowers, a row of graduated pearls with a marcasite clasp, a silver Albert, a pair of pearl drop earrings and a crystal necklace. 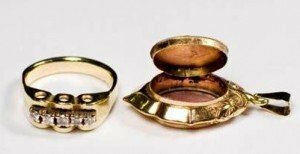 A ladies 9 carat gold ring set with five diamonds on a gold metal shank, together with a 9 carat gold locket pendant. 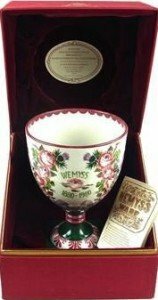 A large modern Wemyss Centenary Royal Doulton goblet by Rogers de Rin. Of ovoid form on a square pedestal base, the exterior decorated in the Wemyss manner with rose and thistle garlands and ribbon tied swags. 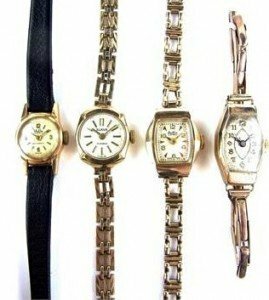 A collection of four gold ladies watches. Comprising a MuDu 18 carat yellow gold watch on a black leather strap; a Slava 9 carat yellow gold watch on a link bracelet; a Bentima 9 carat yellow gold watch on a link bracelet; and an unsigned 9 carat yellow gold watch on a sprung link bracelet. 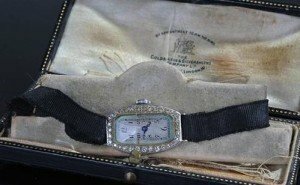 A ladies 18 carat white gold wristwatch, set with diamonds to the outer edge with Arabic hours. 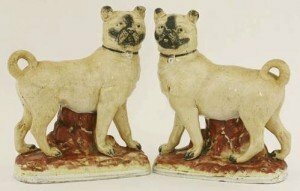 A pair of Staffordshire pottery Mastiff Dogs, each strongly modelled with ochre tinged body, on bright maroon base, the muzzle details in black. 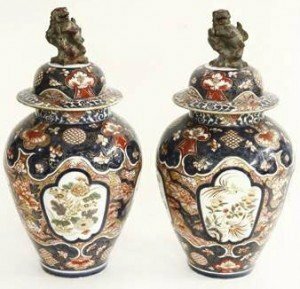 A decorative pair of Paris ‘Arita Imari’ Vases and Covers, each baluster body enamelled and gilt with panels of flowers and ho-o on a ground of peony and gilding, the shoulders with collars of flowers, all in typical palette of underglaze blue, red and gilding, the domed covers with shi shi knop. A French porcelain champlevé-mounted Vase, the pear body midnight blue and painted in Sèvres style, gilt-edged panels of a floral cupid or back pipes, signed Rouchette, the mouth and foot with enamelled stylized decoration, on an onyx base. An ivory figure of Madonna, late 19th century, standing with hands held in prayer, dressed in flowing robes highlighted in gilt, with her hair cascading down, stained in black, mounted on a circular ivory ball and stained green serpent carved with cherubs and a scrolling banner. 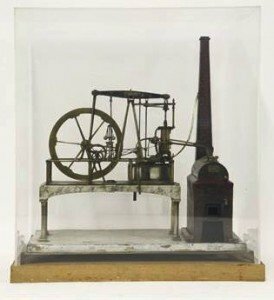 A brass stationary steam engine, with imitation brick boiler and chimney with a beam pump and fly wheel, bearing a plaque inscribed ‘Sarles Maker’ on a brass base, inside a perspex case. 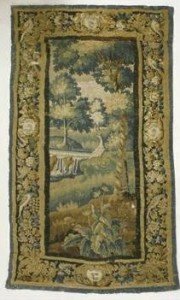 A late 17th century Aubusson tapestry, centred with an heron standing in a river landscape, and decorated with birds to the border. 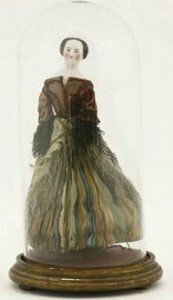 A late 19th Century French fortune doll, wearing a velvet and cloth top, with a dress made from folded ‘fortunes’, on a brass base underneath a glass dome. 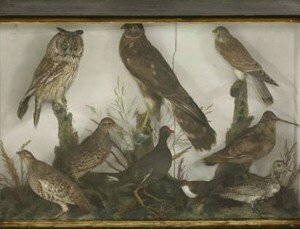 A case of mixed birds, the Victorian glass-fronted box case containing Hen Harrier, Long-eared Owl, Male Kestrel, Dipper, Woodcock, Golden Plover, Moorhen and two Grey Partridge. 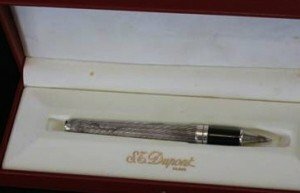 A Dupont solid silver rollerball pen with original box and paperwork wallet, including a ballpoint refill ink. An Edwardian 9 carat floral pendant brooch in original leather box, together with a seed pearl and garnet 9 cart brooch. 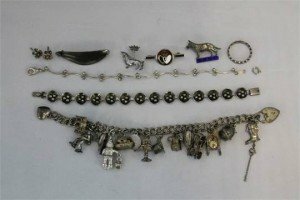 A small collection of jewellery to include a solid silver charm bracelet containing 15 charms of which 10 are silver, a Danish sterling brooch, a Danish silver bracelet and other silver items. 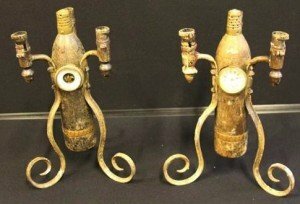 A pair of 1920’s candelabra, made up from French bayonets and cannon mortars, both cut to take a clock movement and barometer. 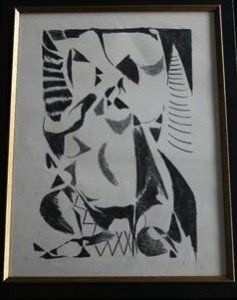 A framed A. Lanskoy black and white lithograph print, signed on the lower right hand corner in pencil by the artist, with a clear gallery stamp impression on the lower left side. 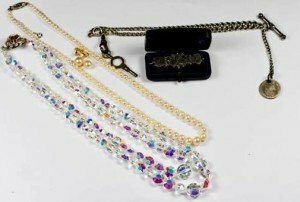 A pair of pearl strand necklaces with diamonds and a 14 carat gold clasp, together with a pair of mabe pearl and 14 carat gold ear clips.